I’ve always had a cat that sits in the litterbox, but pees into the wall. Finney is the one who does it now. 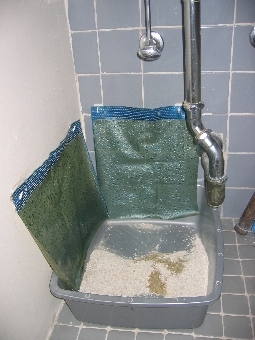 With these plastic flaps (made from shower curtains) the pee hits the flaps and drips back into the box. Thank God he doesn’t pee off the unprotected sides. Please forgive me for not cleaning the litterbox before taking that shot. I hope my cat’s pee doesn’t offend you. Update: My latest and best litterbox invention/solution. That’s something you could patent. I hate pee on a wall, hate it.